Due to conflicts with religious holy days and the NEC convention, our April meeting has been cancelled. See you on May 17. State University at Stony Brook Campus, Stony Brook, NY 11794. Directions: West onto South Drive off of Nicolls Road (County Rd 97). At the light, make a right onto Marburger Drive and then make the next right (the street has no name but there are signs indicating that you are near the Marine Sciences buildings). Follow the road all the way to the back and you will see three buildings - Discovery, Challenger and Endeavour – the last one is Endeavour Hall. 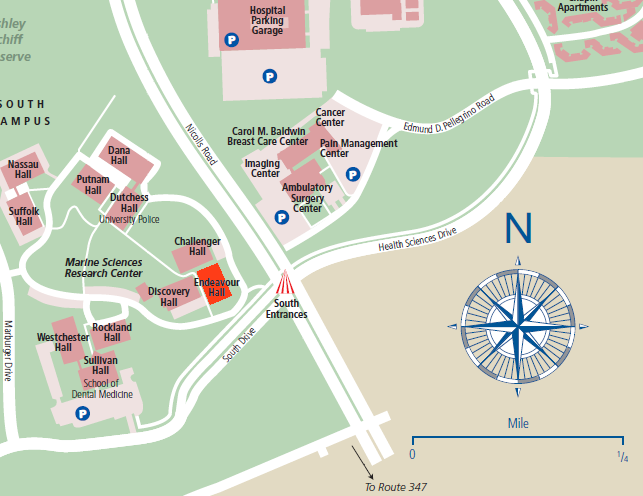 For more information, see this map on the SUNY Stony Brook website (a zoomed portion is shown below).